Antonio Calmani and Douglas D. Grey are a production team that is based in Germany. Together they have been producing for more than ten years now and are worldwide known under other aliases. They toured all around the world during the last years including countries such as Australia, France, Spain (Ibiza), Italy, Poland and Germany, just to name a few. With the following singles "Chasing the Storms" and the official remake of the Black Box hit record "Ride On Time" which received support by international DJ's such as Tiger Lilly from Australia, they showed, in what a range they are able to produce music. CALMANI & GREY don't want to be tight to just one style of EDM - they want to express their ideas in the perfect style for each track. It just has to go well together - this is what counts! 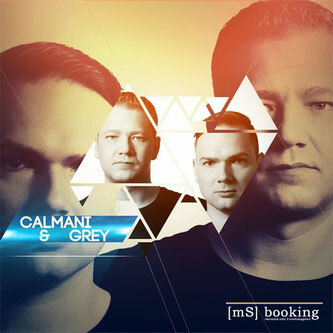 With their current single "Silver Surfer" CALMANI & GREY took one of their most favourite melodies of the 80s computer game scene and also one of the biggest club-hits of the late 90s and made it to one of the biggest club tunes in and around Germany in 2016. With huge support by international Top DJ's, such as Dimitri Vegas & Like Mike, they took another step towards their very own goal: producing the best music for the EDM fans and getting heard. Besides their official releases CALMANI & GREY constantly producing their own "private" remixes of current releases of other artists. On the list are artists like KYGO, ROBIN SCHULZ, STEVE AOKI & FELIX JAEHN and more. With their latest remix of ZEDD & KEZHAs' hit single TRUE COLORS again they refined their style and presented their first pure trap production which instantly got support by artists like the Chainsmokers. Unterstützende Eventpromotion auf Dance-Charts.de - dem führenden deutschen Charts- und Infoportal für elektronische Musik! - Facebookseite: über 50.000 Follower (Stand Februar 2017). Starkes Wachstum aktuell. - Bannerwerbung auf der Webseite. Gut sichtbar. - Viral Videos mit ausgewählter Musik auf Facebook. - Newsletter Versand per Mail. Zielgruppe 100% EDM-Affin.